The Instrument Meteorological Conditions (IMC) rating is an invaluable addition to the PPL for those who wish to fly regularly in the UK. It enables the pilot to extend their skill and qualifications to allow them to fly safely in poorer weather conditions than they would normally be allowed. The sort of weather conditions that frequently reside over the British Isles! Although currently only valid automatically in the UK, it markedly improves general flying proficiency as well as developing the skills to fly purely using the aircraft instruments. 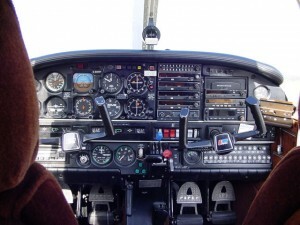 During the 15hr course the pilot will learn how to fly without outside visual references, using only the instruments inside the cockpit. Initially the normal basic manoeuvres are learnt followed by navigation using the Radio Aids (VOR, NDB etc). This leads on finally to flying Instrument Approaches such as the ILS or similar system, to enable the pilot to let down through cloud and land in poor weather. Training is also given simulating the failure of some systems and recovery from unusual aircraft attitudes. The experience, knowledge and skills acquired during the training enable the pilot to fly more confidently in marginal weather conditions and are invaluable when in flight conditions deteriorate below good VMC (Visual Meteorological Conditions). The course is normally undertaken in one of our Piper Cherokee series aircraft (either the Warrior or Archer types), which provides a good stable platform with which to practice instrument flight. In common with the PPL, there is a ground exam to prepare for and take to complete your IMC training. This would normally be done prior to taking the flight test. The flight test is carried out from Shoreham with our resident examiner.